Tokyo has about 88,000 restaurants; the oldest of which, Komagata Dozeu, has been open since 1801. In addition to housing the biggest city in the world, the Tokyo Prefecture also has Japan’s smallest village: Aogashima Village, in the Izu Islands, which has a population of less than 200. As a movie monster, Godzilla has attacked Tokyo no fewer than 28 times and destroyed multiple parts of the city. Tokyo, Japan, is a city that has inspired writers, film producers, and artists around the world. Known for its fast-paced lifestyle and vibrant nightlife, Tokyo also has a wealth of distinctive neighborhoods, world-class dining, and lovely city parks that make great pockets of peace among the hectic day-to-day life. With more than 12 million people in the Tokyo metropolitan area, this city is at the core of the world’s most populated urban area, and it shows in Tokyo’s sophistication and pace of life. The lights of the city’s billboards and buildings are visible for miles, and an extremely modern and efficient rail system connects the different parts of the city. 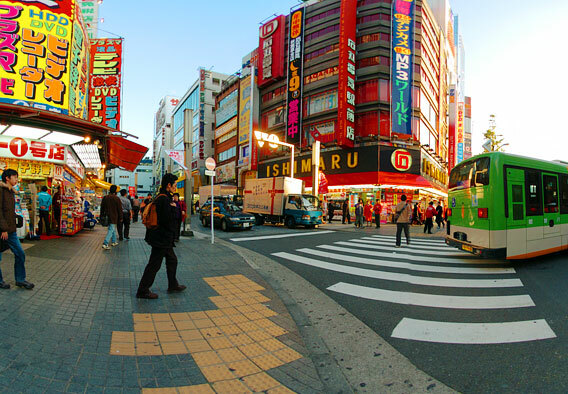 Known as a shopping mecca, Tokyo boasts many areas that cater specifically to shoppers. The newly renovated Roppongi Hills shopping center has fine restaurants and upscale shops, as well as an excellent view of the Tokyo Tower, while the young and fashionable Harajuku area in Shibuya showcases the latest—and often strangest—trends. Visitors who want to sample Tokyo’s famous nightlife head to Shinjuku, which has the city’s liveliest clubs as well as many of its busiest intersections. However, despite its fast-paced modernity, Tokyo still retains glimpses of its traditional past. Buddhist temples such as Sensoji Temple, one of Tokyo’s largest and most popular temples, are a wonderful place to glimpse the traditional beliefs of many Tokyo residents, while the Meiji Shrine in Ginza showcases the spare lines and peaceful atmosphere of Japan’s Shinto shrines. The Imperial Palace is another reminder of how the city is steeped in tradition—the imperial family still lives in the stately building, which is surrounded by manicured lawns, parks, and lakes, and the grounds also include relics of Edo-era castles and fortifications. Meanwhile, at the bustling Tsukiji Fish Market, fishermen and sellers practice a centuries-old trade, gutting fish and eels by hand and delivering them to thousands of sushi restaurants in the city and around the world. 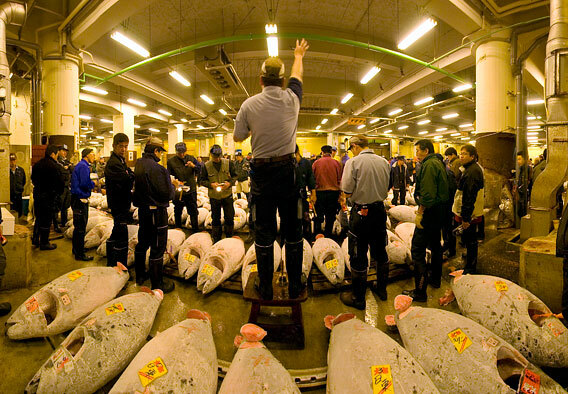 Visitors will have to arrive early to see the Tsukiji Fish Market in action as the market wraps up around 9 to 10 am. However, an early visit is well worth it to see the fresh fish being prepared and sold by the hundreds of sellers in this huge fish market. After you’ve seen your fill, fill your stomach at one of the nearby sushi restaurants, which offer top-grade sushi at discount prices. A food market next to the fish market sells knives, vegetables, dried fish, and other necessities. 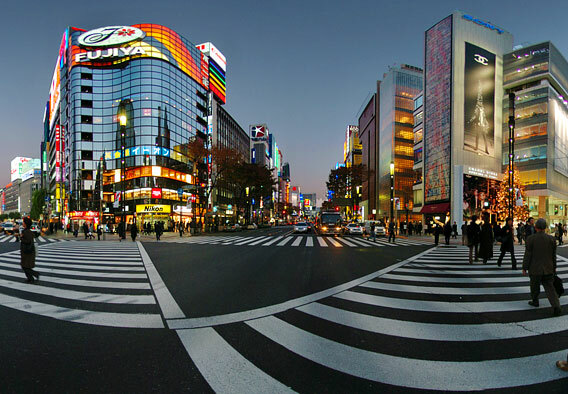 Ginza is at the center of Tokyo and boasts many of its top attractions. Ginza has many of Tokyo's largest and most established department stores, and designer shops line the streets of the district. The luxurious Wako department store is one of the main hubs of pedestrian traffic in the area, and other notable stores include the Mitsukoshi and Matsuya department stores as well as the giant Sony building. Ginza also contains Tokyo's most famous kabuki theater, the Kabukiza Theater. Akihabara Electric Town is the place to go if you're looking for the latest laptop or electronic knick-knack. Shops range from tiny stalls located under a flight of stairs, to large electronics retailers that carry a range of goods. If you're looking for a rare electronic component or anime cartoon, chances are that you'll find it somewhere among Akihabara's colorful shops. Stores in the area carry comics and accessories, and Akihabara is also a popular gathering point for fans of anime, manga, and video games.